August 27, 2018 at 9:33 pm. To say Stanford fans are feeling the love for their 13th-ranked Cardinal would be an understatement. Coming off a somewhat disappointing 2017 when they went 9-5, the Cardinal are flying sky-high heading into 2018 thanks to their senior running back and Heisman Trophy candidate Bryce Love. Love decided to come back to Palo Alto for his final year after finishing second to Oklahoma’s Baker Mayfield in last year’s Heisman voting. He was the Doak Walker Award winner, Pac-12 Offensive Player of the Year and Lombardi Award winner. And now he kicks off his senior season Friday night when the defending Pac-12 North champion Cardinal welcome San Diego State of the Mountain West to Stanford Stadium. Each team has been to a bowl game in the past eight seasons and each team boasts a powerful running game. The Aztecs must replace Rashaad Penny, who in 2017 led college football with 2,248 rushing yards to go along with 23 rushing TDs. San Diego State veteran coach Rocky Long is confident he has his man in Juwan Washington. For the Cardinal, Love is the focal point of a versatile and high-powered Stanford offense. Love accumulated 2,118 rushing yards to go along with 19 TDs to lead a Cardinal offense that averaged 32.4 points and 388.6 total yards. Expect the offense to be just as prolific, but don’t expect Love to top last year’s stats. “Preparing for this season, I’ve had a lot of experience with this,” coach David Shaw said as he talked about superstars forgoing the NFL to return to Palo Alto. “First, there was Andrew Luck. And with Christian McCaffery coming back from his All-American sophomore year for his junior year. I told Bryce, this year can’t be about stats. It’s about getting bigger, stronger and being more versatile. Love bulked up about 10 pounds in the offseason and has become a “markedly better pass blocker,” Shaw said while hinting Love might be used more as a receiver out of the backfield this season. “While we want to feature one of the best players in college football, we don’t want to wear him out,” Shaw told the San Francisco Chronicle. While Love gets the national attention, Washington has toiled as a backup the past two seasons to two 2,000-yard rushers, D.J. Pumphrey in 2016 and Penny in 2017. Now he gets his chance to continue the Aztecs’ streak of 2,000-yard rushers. Washington, who flashed star potential as Penny’s backup in 2017, carried the ball 127 times for 759 yards and scored seven touchdowns. Long also will have Washington return kickoffs and punts. With an offensive line that returns five starters, Long is expecting great things from Washington. San Diego State also has the luxury of having a veteran quarterback calling the signals. Senior Christian Chapman’s numbers might not jump off the page, but he completed 60.1 percent of his passes in 2017 for 13 touchdowns with only four interceptions. Stanford quarterback K.J. Costello also returns and is firmly entrenched as the starter. Costello took over the starting job midway through 2017 and completed 58.8 percent of his passes for 1,573 total yards. He recorded 14 touchdown passes to go along with four interceptions. Costello was on the sideline last season when Chapman completed an 8-yard pass to tight end David Wells with less than a minute remaining to give the unranked Aztecs a 20-17 home win over the No. 19 Cardinal. The Cardinal return 18 starters, and many remember the home fans swarming the fields. Shaw certainly remembers and Stanford faithful can be sure the Cardinal will be prepared. “I hope we didn’t take them lightly, but I didn’t do a good job of getting us ready to play a very good, very physical football team that not only runs the ball but has a quarterback that can get out of the pocket and do a bunch of different things,” Shaw said after the loss last season. The Cardinal on Monday announced that two starters, center Jesse Burkett and cornerback Alijah Holder, will be held out of the game because of injuries. San Diego State was picked to finish second behind Fresno State in the West Division of the Mountain West in a preseason media poll. 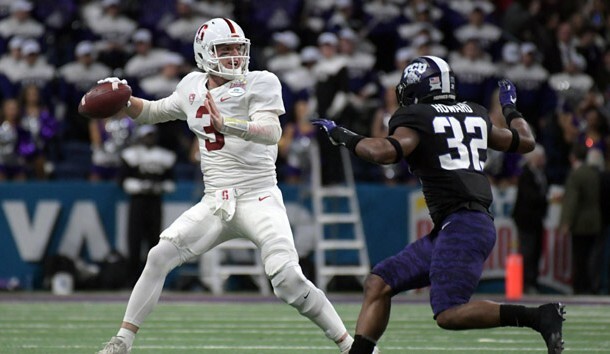 Stanford was picked to finish second in the North Division of the Pac-12 behind Washington.